These elements include the OpenEdge Management/OpenEdge Explorer configuration tool, mergeprop utility, and command-line utilities. The following figure shows an example of a client/server DataServer application that is configured with Unified Broker AppServer Instances. The figure illustrates how to combine clients and servers that run on different platforms. In the figure above, the OpenEdge client runs on a client machine (either in Windows or in UNIX) and can access a remote machine that has the OpenEdge Management or OpenEdge Explorer to manage the Unified Broker instances. The connection between the OpenEdge client and the AppServer residing in the remote machine is established using AppServer networking, and the connection between the several DataServer broker instances is established using OpenEdge networking. For every AppServer Agent, the connections between the DataServers residing in other broker instances is established using the OpenEdge networking, that is, the DataServer client components of the Agent establish connection with the server components of the DataServers in corresponding DataServer broker instances. Each DataServer can spawn a multitude of DataServer processes, and a Data Source Linkage specifies how the DataServer processes use the ODBC driver to locate and connect to the data source. instance can connect to server components in a Unified Broker DataServer Instance of the traditional OpenEdge AppServer or server component processes spawned from the traditional ProBroker product. For more information on configuring and managing the AppServer, see OpenEdge Application Server: Administration. instance can connect to serverThe framework also facilities activities that are fundamental to the MS SQL Server DataServer's broker-based technology. For example, the AdminService, the framework's central element, enables supported products like the DataServer for MS SQL Server in managing an application's resources. 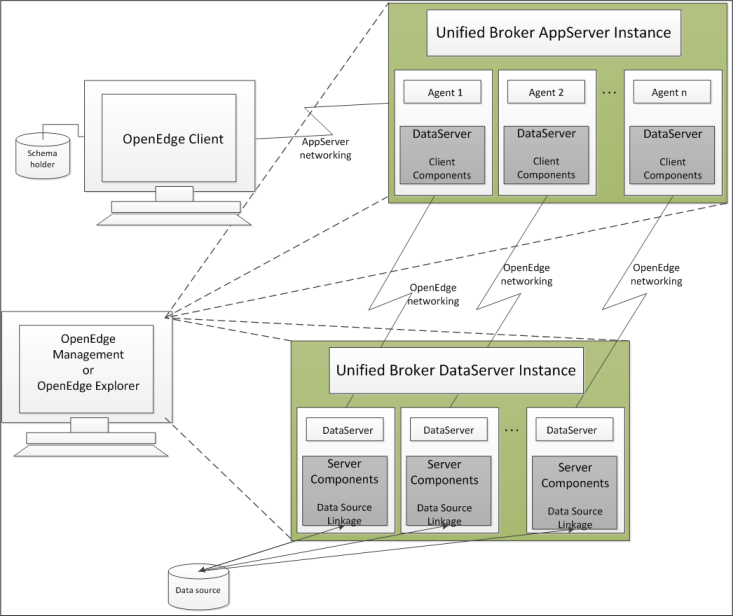 For details about the Unified Broker Framework, its elements, and the OpenEdge products that employ its features, see OpenEdge Getting Started: Installation and Configuration.